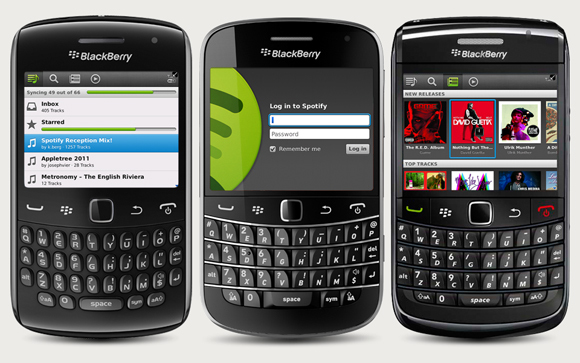 Spotify has officially released their new BlackBerry app into public beta. Spotify is a music streaming company that has become quite popular as of late so the app couldn't have come at a better time. There's only 2 slight problems, you need to be on a GSM network (no love for us CDMA users yet) and it's only been tested on the following devices: 9780, 9700, 9300, 9000, 8520. As with all Spotify mobile applications, you will need a Premium Subscription ($9.99 a month) to stream songs from their catalogue. Also, remember this is in beta so you should probably back up your device before installing just to be on the safe side. If you're one of the daring ones and download the app onto one of the devices not listed above, leave us a comment down below of which device and how well it's working.